Setting a strategy to find the right entry position is one of the most important trading steps. Not only to increase the opportunities that can be achieved, but also to complete the trading plan in order to obtain satisfying long-term results. As discussed in the article about trading plans in binary options, the entry rule is one of the elements that can determine the success of the implementation of the trading plan itself. Therefore, this article will discuss more about one of the entry strategy recommendations, namely the trading breakout method. 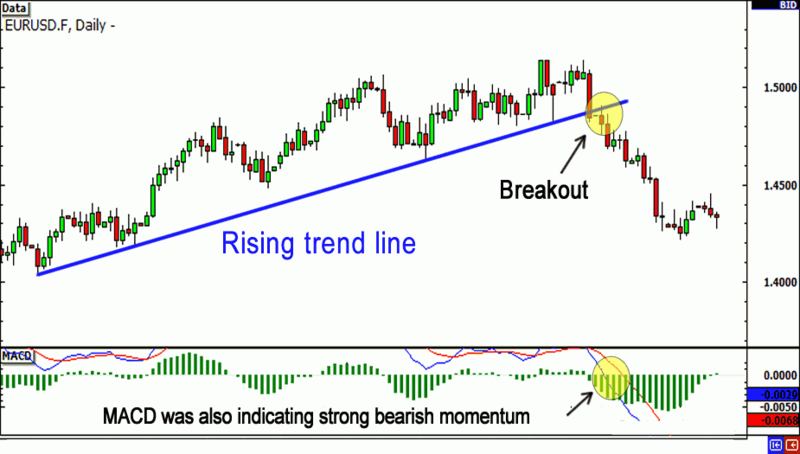 In trading on the forex spot market, ordinary traders recognize the breakout strategy as a way of trading that relies on breaking prices at key levels. Whether it's support or resistance, the price movement that shot from one of these levels is considered a golden opportunity that can bring a lot of profit if traded properly. The price movement formed after breaking the key level is often expected to advance to a level that is much higher or lower than the previous position. This condition is very beneficial for forex spot traders whose amount of profit is obtained from the achievement of pips on sell orders or buy that they install. For binary options traders, placing an entry in accordance with the direction of the breakout will provide additional confidence in the option opportunity to end in-the-money. In addition, traders will also be more flexible in determining expiry time, because prices tend to be on the same trend for quite a long time after breaking through one of the key levels. Compared to a reversal strategy that aims to put a "put" option when the price is at the highest level and place a "call" option when the price reaches the lowest level, breakout trading is more widely used because it is considered to have a higher profit opportunity. By utilizing momentum, the breakout strategy is able to provide promising entry signals, and is quite easy to implement so that it is suitable for newcomer traders. Many technical tools can be used to complement this breakout strategy. Usually, traders will look for determinants of support and resistance to find the right key level. Many choose to use Fibonacci or pivot points and combine them with other indicators when trading with the breakout method. However, traders sometimes need to learn a lot and get used to the use of the two indicators above, because Fibonacci is subjective, while the accuracy of pivot points is still considered doubtful. Traders are advised to practice frequently and familiarize themselves with the use of these two indicators in order to achieve maximum results. Key levels can actually be determined from the limits of support and resistance from other indicators. Traders can make trendlines and MA lines as more flexible batassupport and resistance. In addition, there is also an analysis with a chart pattern that can provide a breakout signal without having to install and manage any technical indicators. Trendline indicator (trend line) is one of the simplest technical indicators with fairly accurate analysis results. Traders only need to draw the trendline diagonally on the price chart according to the trend formed. If the price is experiencing an uptrend, the trendline is placed below the price movement, while when the price experiences a bearish trend, the trendline is positioned above the price. The location of this trendline can then be used as support (on an uptrend) and resistance (on a downward trend) which if successfully broken, the price will turn sharply. In the picture above, a trader can place a "put" option when the price breaks the trendline line that functions as a support limit. This indicator can be placed in any timeframe, so that its use is not limited to traders of certain types only. The difficulty of applying this indicator usually comes from determining the validity of the trendline itself. Traders usually have difficulty finding trend strengthening patterns with several peaks or price bases that can be linked to form a trendline. The more peaks or bases connected, the more valid the trendline. In fact, prices often form a retracement and describe a trend pattern that is peak or basically less reliable to form a valid trendline. 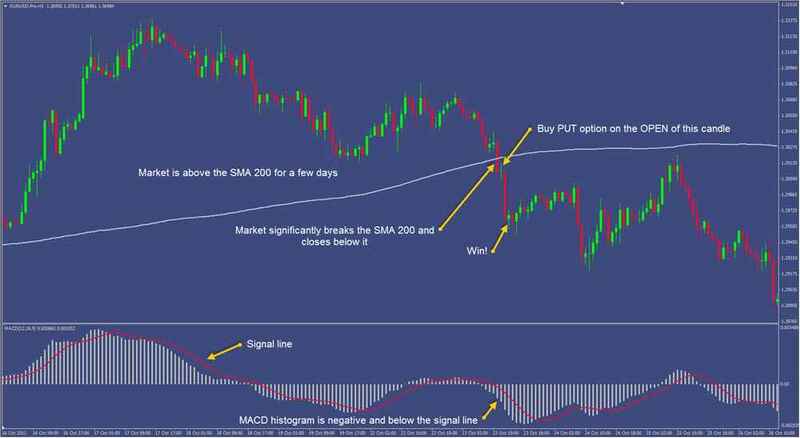 Moving Averages (MA) is also one of the most popular trend indicators used by many forex spot traders and binary options. MA variations and flexible period settings make this indicator a popular trading tool to install in various timeframe settings. In practice, MA can also be used as a support or resistance limit, depending on the direction of the price trend that is being formed. In this case, the use of MA more or less shows the same indication as the trendline, namely to wait for a reversal when the price manages to break out of the support or resistance line. It's just that the appearance of the MA that is more flexible and always moves to follow the price makes this indicator easier to install and analyze. Traders also do not need to test the validity of this indicator, because the MA always displays price movements in accordance with the calculation of the average of a certain period. The example chart above illustrates the use of 200 SMA on the EUR / USD chart in the H1 timeframe. Periodization of a high MA (200 days) is indeed the first choice for traders who want to use MA as a limit of support or resistance. It can be seen that the 200 SMA acts as a resistance line when the price is downtrend, and when the price breaks out from that line, the 200 SMA turns into a fairly stable support. The price breakout of the 200 SMA can be a strong entry signal because prices are then at a high level in a long period of time. The disadvantage of using this indicator is only from its lagging nature. If it is functioned as a trend indicator, 200 SMA can indeed make traders enter the position too late. But if it functions as support or resistance, the 200 SMA can be a stable indicator to look forward to the price breakout of these levels. One way of trading breakouts that are categorized as methods with difficulty in the 'medium' level is a chart pattern. 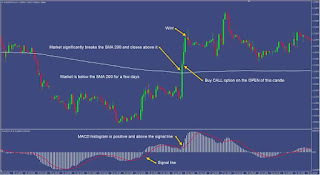 This strategy is considered more difficult because it is generally carried out without installing any technical indicators that can send signals for entry. If you don't have to bother about setting up technical indicators, then why is chart pattern analysis considered more difficult? In fact, it is not easy to recognize the chart patterns that are being formed and confirm the signal they are producing. Not to mention there are many types of patterns with each indication that can make new traders quite troublesome at the start of trading. With enough practice and experience in using this pattern, traders can rely on chart pattern analysis as a sign of a promising entry signal. One type of chart pattern that can be relied upon to implement a breakout strategy is the triangle pattern. Both ascending, descending, and symmetrical types, all kinds of triangle patterns signal the possibility of a strong breakout. The difference, the ascending triangle indicates a breakout of the price upwards, while the descending triangle indicates a breakout of the price to a lower level. Meanwhile, the symmetrical triangle is less able to identify the direction of the breakout more definitely. Even though it has a high profit opportunity, an inappropriate analysis of the trading breakout can make a trader misplace the option position. This happens because the price only only crosses the support or resistance limit for a moment and then reverses course and does not continue its breakout. This situation is called the false breakout (fakeout), which is also a big enemy of traders breakout. Using more than one indicator can be a solution that can help traders to confirm the entry signal from the main indicator used. 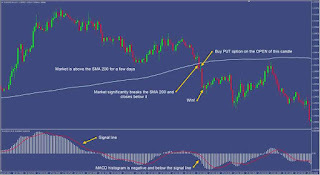 In some of the examples above, MACD is used as an additional indicator that is used to complete the entry signal on the price breakout of the trendline and 200 SMA. The chart above shows an indication of a breakout that occurs when the price breaks the support of the 200 SMA. At the same time, MACD also drops to a negative level, so that the trend change signal becomes more confirmed. Thus, the breakout condition of SMA 200 and MACD can be a valid "put" entry signal. 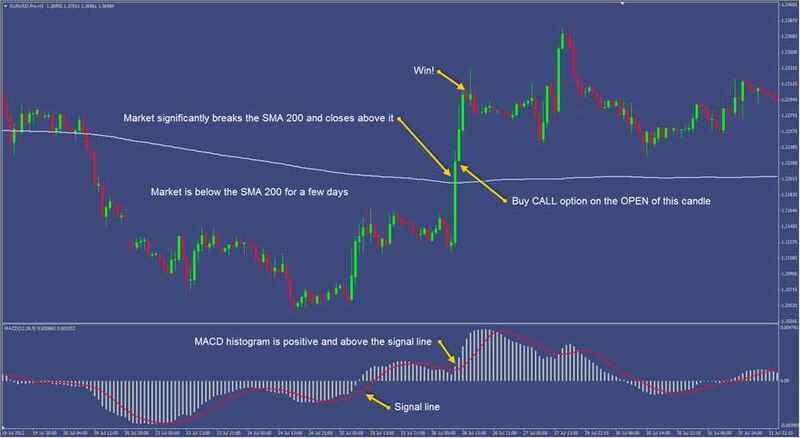 Price action is often a marker of accurate entry and is relied upon by most traders. The trace of price movements at the price action that can reflect market participants and always repeat allows traders to be able to recognize certain candle patterns and predict the next price movements more easily. Price action strategies such as analysis on pin bars and inside bars can help traders recognize more valid entry signals after a breakout occurs. Price action user traders generally see a candle pattern that is formed in a key area or waits until a number of candles are formed first in order to ascertain whether the price is really a breakout or just a fakeout. Not in a hurry to open options when prices have just passed the support or resistance level are the main keys to using this strategy. "High" and "low" levels are parts of OHLC (Open, High, Low, Close), which are also effectively applied as technical indicators, but are often overlooked. Traders are usually more interested in analyzing candlestick patterns directly to get their visual appearance. In fact, by paying attention to price levels in the previous period and comparing the numbers achieved in the following period, traders can also get an idea of ​​price movements to be able to determine the direction of taking options more easily. For example, trader A trades with a D1 timeframe. To estimate today's price movement sentiment, A looks at the highest and lowest price levels the previous day. A then gets a signal that the price has moved up to a level higher than the top price position yesterday. Thus, the indication of the "call" option can become stronger because the breakout of prices from the highest level of the previous day is a pretty convincing signal of price movements. In conditions like this, looking for entry opportunities to place a "call" option on a smaller timeframe can produce promising profit potential. Achieving prices that are able to pass high or low levels from the previous period is an important indication in determining the direction of options. 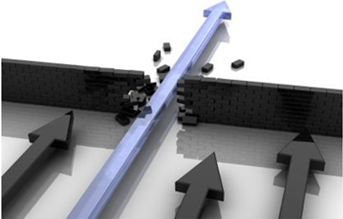 When prices have not been able to penetrate one of the highest or lowest levels, traders are less advised to place options according to the breakout method. For users of breakout trading, anticipation of fakeout is often a priority because it can destroy trading positions that are placed inappropriately. This aspect is indeed important, but it's also a good idea if the trader is able to set the main indicators to support the trading breakout method that he runs. In addition, it is also important not to overlook fundamental factors, because fantastic price movements are often related to the results of data from certain fundamental elements.